In 1995, Pelli Clarke Pelli Architects was selected to design an expansion and renovation of the exiting facility at the Mystic Marinelife Aquarium and Institute for Exploration, a marine education and research facility that supports an extensive collection of sea life. The aquarium and institute as a whole is a leader in oceanographic and deep sea archeology. The mission of the Sea Research Foundation, the non- profit part of the institution, is exploration, research and education in the conservation of the oceans. In 1999, Dr. Robert Bollard’s Institute for Exploration joined the Mystic Aquarium in the opening of the exhibit and research spaces. Architectural additions to the aquarium include the Institute for Exploration, a new entry pavilion, and covered walkways to re-organize the complex. The expansion of the aquarium includes 75,000 square feet of new construction, the renovation of 40,000 square feet and approximately 30,000 square feet of new interior and exterior exhibits. The new Entry Pavilion and Institute for Exploration are part of a design that is based on the assembling of distinct forms into a cohesive grouping similar to a painted collage, the walkways being the connective elements that tie the new design with the existing buildings. The sculptural, blue cone shape of the Institute for Exploration focuses inward, invoking the sense of mystery to be discovered in the depths of the ocean, whereas its counterpoint, the Entry Pavilion, has an inviting, umbrella-like form and is reminiscent of early 20th century garden pavilions. While at Pelli Clarke Pelli Architects, Michelle LaFoe was a designer for the Entry Pavilion and the Institute for Exploration working closely with Cesar Pelli and Fred Clarke. 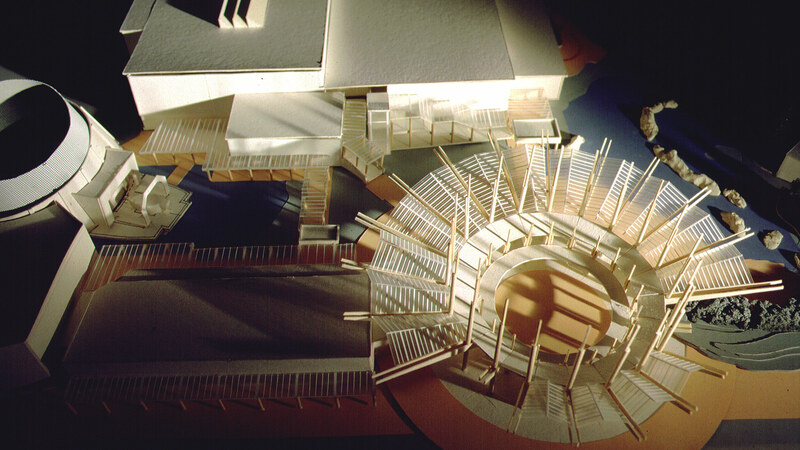 The team created multiple design iterations in models at various scales to study the translucency and the form of the Entry Pavilion and, conversely, the concave/ convex shape of the more introspective Institute for Exploration.